Blog Beads on Cannon, Charleston Sc "my neighborhood has a bead store!" Beads on Cannon, Charleston Sc "my neighborhood has a bead store!" 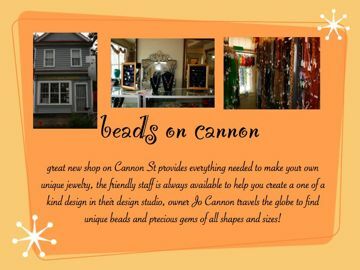 Last weekend, I crossed the street and went shopping at my neighborhood bead store “Beads on Cannon” despite an unassuming exterior the interior will blow you away, especially the upstairs which has more gems that Alladin’s cave and Blackbeard’s chest combined. Not only can you purchased individual beads of all kinds, you also may choose from an array of carved ivory, jade and other treasured. They also have everything you need to turn these treasures into wearable art. The design studio is even available for parties and the bead experts are friendly and helpful.